Hubbell's enhanced 100BASE-T telco patch panels are used to connect 10/100BASE-T fast hubs to a Cat5/Cat5e network. 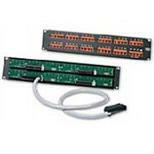 The patch panel features Cat5 modular 50-pin/25-pair telco connectors connected via a PCB to 12 two-pair, 8 position, Ethernet wired RJ45 modular jacks. This PS Cat5 performance, modular 50-pin/25 connector is compatible with industry-leading 100BASE-TX and 100BASE-T fast Ethernet hubs.